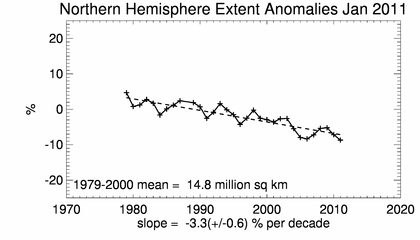 NSIDC often publishes this graph showing that the Arctic is doomed. What they aren’t showing is that their data set started right at the peak for the last century. 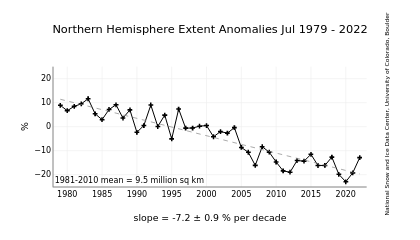 No doubt, in fact, I’d be very concerned if the Arctic extended beyond its “high water” mark. We could then have discussions about the coming ice age. We are still running into the problem of volume vs surface area. The total volume of the ice is a much more important data point than the extent. The problem with that is there is NO way to get that accurate either! Volume would be WAG just like area is now! Both measurements reflect what is already known by logical people, the amount of ice in the Arctic is not stable and has never been. Measuring either is a waste of money and the only benefit is to navigation in the region as it has no bearing on global climate! The real problem is making Wild Guesses about any possible trend! Hmm, Steve had a post a few days ago about how we have more multi-year ice than recently. But, I agree with Mike, arctic ice is a waste of time and is a red herring for the alarmists. If it melts, so what? It mostly melts in the summer anyway. The light distribution from the sun is minimal during the summer, so the albedo effect is negligible. When the arctic has it’s most ice, the sun doesn’t shine, so there’s no albedo anyway. Further, if we buy into the CAGW premise, a melted arctic has an opportunity to out-gas or sink CO2 while a frozen one will not. Also, there’s energy(heat) release with a melted arctic which doesn’t occur with a frozen arctic. The point is, while arctic ice may or may not be a proxy for warming, it has very little impact on our climate as a whole. Only one thing is missing….MODELS! Not a mention. Back in the good old days, why, they reckoned with results. They dithered with data. They manipulated with measurements….oops, they still do that, don’t they… They could still speculate about sulfates, though. CO2 was just a gleam in Hansen’s eye, unborn yet festering like a boil soon to be lanced. Nothing like starting your data set at 1979, the height of an anomalously cold period. 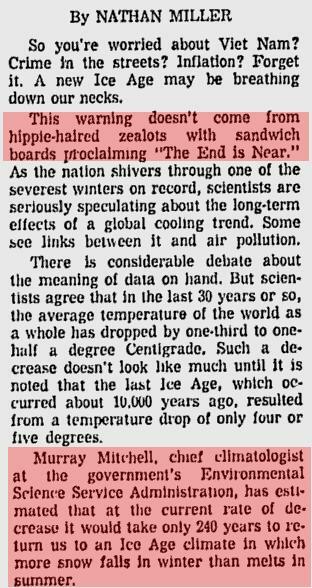 Much of the so called “warming” being claimed by alarmists is just a rebound from that cold period back to the long term normals prior to 1960.